Working out is an important part of your senior’s overall health and well-being, but sometimes life and other things get in the way of an exercise routine. If your elderly family member isn’t eating regularly or is resisting eating the right foods, her energy levels might be flagging a bit. It might be a good idea to talk to your senior’s doctor about what types of foods are best for her and whether a meal schedule is right for her. A good snack before working out could be an option, too. Some protein and carbs can help quite a bit. Something simple like apple slices with peanut butter might be perfect. She’s Experiencing Aches and Pains. 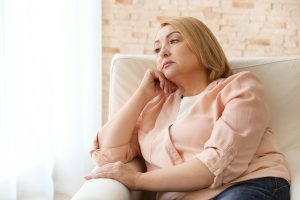 As your aging family member grows older, it’s very possible that she’s experiencing aches and pains that she didn’t experience even a few years ago. She might even be worried that these less than friendly feelings might keep her from exercising. But as long as her doctor agrees that exercise is okay for her, movement can actually help her to ease some of that pain. Her Regular Exercise Partner Isn’t Available. In some cases, your elderly family member might have been exercising regularly with someone else. But what happens when that person isn’t available? For many aging adults, that can mean that they opt out of exercising completely. Hiring senior care providers can be a good way to fill that gap for your elderly family member, especially if you can’t exercise with her. She’s Getting Started Late on Her Workout. Your elderly family member might stick to a schedule to keep herself on target with all of her goals. Unfortunately, sometimes life has different plans and that might mean that something cuts into her exercise time. Truthfully, a shortened workout that she still does is a lot better than no workout at all, even if she does something she doesn’t normally do. That might mean a quick walk or a few stretches rather than her normal routine. She Just Doesn’t Feel Like Exercising at All. Some days a workout just doesn’t feel like what your elderly family member might want to do. That’s a perfectly valid feeling, but sometimes just trying to move a little bit is helpful, too. Encourage your senior to give a workout a little bit of a try, even if it’s just a few stretches during a commercial break. Talk with your senior’s doctor about what signs indicate that she really shouldn’t exercise. They’re going to vary depending on her health and other issues that you and she need to stay on top of regularly. Understanding those variables is going to help her understand when she truly needs to take a break.